Michael Canet | The Savvy Investor How Does the Dissolution of Section 179 Affect Small Businesses in 2015? 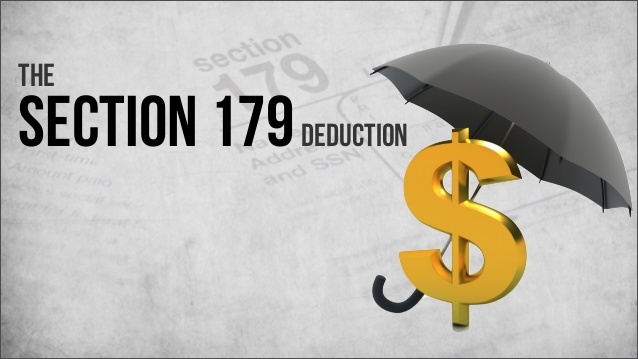 How Does the Dissolution of Section 179 Affect Small Businesses in 2015? It’s a new year, maybe even a new you, and definitely a new world when it comes to growing your small business thanks to the retracting of the Tax Extenders Act which raised the Section 179 limits to 100% of purchase-based. The act expired on December 31, 2014 and that’s not even the half of it. Actually, it is half of it. The deduction limit dropped from 100% to its previous 50% in 2015 leaving small businesses working harder to find the funds needed to grow their business. But it wasn’t always this way. In fact, the Tax Extenders Act started in 2008 as part of the stimulus package during the economic implosion as a way to strengthen the dire situation for businesses—large and small alike. So while it more than achieved what it needed to over that time, and the extension last fall was what Congress might consider a gift, its original intent was never to be a permanent fixture in small business tax code. So how should small businesses who started or grew to rely on the benefits of Section 179 manage in the new year? Here’s a breakdown of what changed for small businesses based on a recent article in the Washington Post and what we think the effect will be on small businesses. The allowed deduction for large assets like equipment, property, and software under Section 179 was $500,000, but when it expired on December 31, 2014 it dropped to $25,000. This eliminates an immediate tax break for small businesses, especially start ups and those looking to expand. It could very easily restrict some from growing to their full potential, and some, ever starting at all. This credit completely expired at the end of 2014, and along with it many small businesses their hopes and plans for new products or improving processes. The brief two-week extension of this portion of Section 179 not only benefited small businesses, it actually improved environmental standards as well allowing businesses that “built or renovated property featuring renewable energy technology” a special tax deduction. Businesses who hired military veterans, long-unemployed or service-disabled veterans were issued credits under Section 179. Not anymore. We can’t help but feel that this is not only a disservice to small businesses, but even more so a disservice to our country’s veterans. It’s obvious that small businesses greatly benefited from Section 179, but it should also be noted that society at large did, too. Entrepreneurs had more incentive and collateral to start up their small business providing a service or product to their community and in turn providing for their family. Business owners invested more heavily in environmentally friendly buildings and technology which in turn helped the planet. And, of course, they were encouraged to hire our country’s heroes. So, as small businesses spend another year waiting for Congress to make legislation like Section 179 permanent, they can still introduce new products, expand their business, go green, and hire a veteran. It’s just this year their incentives might be less about significant deductions and more about taking credit for doing something significant.